The Traditional Schoolship Program is a time-tested, student-approved program where students get hands-on with a wide variety of lake organisms and experience the thrill of sailing a tall ship schooner. The "Discover Sail" program begins with creature collection directly from the lake, and ends with up-close interactions with fish, plankton, organisms from the bottom of the lake, and water quality testing. Students work together to raise the sails and haul in the anchor, and discover how 45 tons of steel can float. Plus, everyone gets an opportunity to steer the ship! 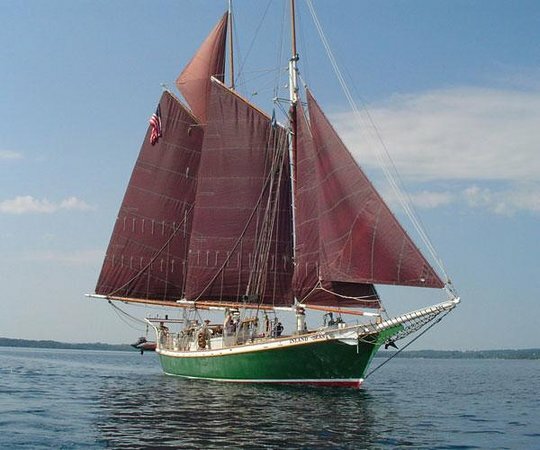 The Program is designed for students from 4th–8th grade and is a half-day science learning adventure aboard ISEA’s 77′ schooner Inland Seas or the chartered 112′ schooner Manitou. The curriculum can be easily modified for the knowledge of the students onboard. The onboard curriculum is designed to complement the Michigan Curriculum Framework Science Benchmarks in physical, biological, and earth sciences, as well as history and geography. Each sail is 3 hours in length. Please arrive 30 minutes before the scheduled start of the trip. Guests are welcome to bring water bottles, but no glass and no food, please! Safety: Safety is our primary concern. Inland Seas is licensed and inspected by the U.S. Coast Guard and is sailed by a licensed captain and professional crew. Experienced instructors lead our classes. These guidelines will help make your sail enjoyable and enriching. Please listen to the captain and crew and obey their instructions (at times it will be necessary to be quiet so that the captain and crew can communicate). The crew will answer any of your sailing or navigation questions. Clothing: Dress for outdoor activity! It is almost always cooler on the water than it is on land. Layer your clothing (t-shirt, turtle neck, sweater, jeans, maybe even long underwear!). Wear non-skid shoes (tennis shoes or hiking shoes). Flip-flops or sandals are not recommended. Bring rain gear, a warm jacket—wool hat and gloves if temperatures are cool. It is better to bring too many clothes than to be cold because you did not bring enough. There will be storage for your extra clothing, packed in a soft duffel-type bag. Inclement Weather: We will contact you the day before your sail if adverse weather is threatening. Sessions will be cancelled in the event of high winds, thick fog, or lightning; however, rain and cold will not deter us! Schoolship Photographs: The Benzie Conservation District and ISEA often document the Schoolship experience for public relations and promotional purposes, including for use on our websites. If you do not wish for your child to be photographed for this purpose, please notify the District, 231-882-4391. ​The Frankfort sail leaves from the Frankfort Municipal Marina, 606 Main Street, Frankfort, MI 49635.